In this interview, Paul Somerson discusses Arts and Crafts silver items and jewelry, including the history of the Kalo shop and other famous artisans. 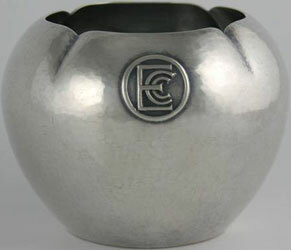 Paul can be reached via his website, Chicago Silver, which is a member of our Hall of Fame. How did I get started collecting Arts and Crafts silver? My wife and I had been collecting Arts and Crafts items as far back as I can remember, mostly furniture and tiles. One day many years ago I got bit by the silver bug. We lived in California and I’d visit antique dealers and one of them showed me a silver serving spoon by Chicago silver maker Falick Novick. It was beautifully made, the shape was great and it had little marks all over it, which I soon learned are called planishing or hammer marks. Very few silver makers make anything by hand these days, but when they do, they polish it smooth so it has a mirror-like surface, and get rid of the hammer marks that were on the piece. But the Arts and Crafts makers kept those marks on the surface. As a result, every piece was different and the marks act like little facets on gems and diffuse the light; it makes the item gleam and glow. I just loved it and wanted to see more, and I spent the next few years trying to find as much as I could. Collectors Weekly: Why do you collect silver? Somerson: I like some copper items, but I’m primarily interested in silver and have also become interested in jewelry. There wasn’t a lot of Arts and Crafts stuff made in gold, but what there was is very beautiful. When people talk about Arts and Crafts silver they generally mean Holloware like bowls and trays. Some Holloware is incredibly lovely. Silver has some interesting properties. It tarnishes, so you have to spend a lot of time cleaning it. That’s a minor nuisance, but if you love your objects, it’s not so bad. Once it’s clean, you just have to polish it every year or two to keep the shine. A major headache is photographing silver. It’s like taking a picture of a mirror, so it reflects you, the camera, the room, light, and anything else close by. There are ways you can deal with that, a special apparatus called a light tent where you put the silver inside and it reduces the reflection somewhat. When you take a photograph of multiple pieces like a tea or drink set all the pieces reflect each other so it ends up being jarring. Silver also takes a lot of room to store, because you have to pad it so it doesn’t bump up against anything else. But the nice thing about silver is it’s very forgiving. If I have a beautiful ceramic vase, and I drop it, the value goes down instantly. You can often have ceramics repaired but once you do that they’re not worth as much as they were intact. With silver, you can drop something and easily have it repaired, without changing the shape of the object, or destroying its historical integrity. We have a lot of tea sets, and storing tea sets is a nightmare because you have the trays, a burner, a tea pot, a coffee pot, a cream vessel, a sugar vessel, a waste vessel, and sometimes even sugar tongs. They’re big, the trays can get up to 2 ft. or more in length. That is one of the reasons I became interested in Arts and Crafts jewelry: it’s a lot easier to store, but it’s also in many ways more interesting. Arts and crafts jewelry pieces are miniature works of art. You can take a loupe or magnifying glass and see a level of detail and intricacy that is astonishing on some of the early pieces by makers like Hale and Shaw and Oakes. Arts and craft jewelry is very hard to find — there isn’t much of it out there. In fact there isn’t much Arts and Crafts metal out there, for two reasons. First, it was all made by hand, and it took a lot of time to make one piece, sometimes days or even weeks. And second, every so often, the price of silver goes through the roof. Right now it’s at 17 or 18 dollars an ounce and two years ago it was 3 or 4 dollars an ounce. Arts and crafts silver was generally very heavy, made out of heavy gauge sterling. The pieces were big and they weighed a lot. So people take it down to a smelter and get a few hundred bucks for it. And it’s gone forever. It’s happening as we speak, it’s really a tragedy. It also happened when the Hunt brothers drove up the price of silver. If you look at eBay right now there are a lot of Arts and Crafts silver items listed as “high scrap value.” I have tea sets where the silver alone is worth 5,000 dollars, and that’s not even counting the artistic value. Over the decades, a lot of beautiful silver objects have doubtlessly been melted down and there’s nothing we can do about it. People don’t have afternoon teas anymore where they bring out a tea set. Silver is not as popular as it used to be. If you look at an old movie, when they show an old house in the 1930s, an upscale, proper house, with servants to clean the silver, you’ll see silver everywhere. Silver pitchers on trays, tea sets, drink sets, vases. It used to be what you did, you didn’t buy plastic, you didn’t buy stainless steel, you bought silver if you had the money. Collectors Weekly: How many people collect Arts and Crafts silver and jewelry today? Somerson: Silver has always been under-appreciated. The big Arts and Crafts categories are furniture and ceramics, and silver is sort of the stepchild. But there are people who absolutely love the beautiful shapes and workmanship, some pieces with jewels in them or enamel on the side. So there aren’t many silver collectors out there, but a lot of jewelry collectors who appreciate Arts and Crafts jewelry. Now of course there’s Art Nouveau jewelry, Arts and Crafts jewelry, Art Deco jewelry and other movements like Edwardian jewelry. It often gets lumped together, especially on eBay. A lot of people need an education in what Arts and Crafts jewelry really is. The best Arts and Crafts jewelers were people like Frank Gardner Hale and Edward Oakes. You have to look closely at their work. Everything was made by hand, all the jewels were bezel set, which means that there was a little ring of metal around the bottom of them instead of having prongs. And there was a real love of nature in those pieces. Many of the motifs involved were leaves and vines and fruits. Collectors Weekly: Where have you done most of your research? Somerson: There are about a half dozen books and magazine articles, and a few websites, but there isn’t too much. A few museums have some Arts and Crafts items, Boston, Cleveland, Chicago, but they don’t treat it as a star attraction, they don’t really feature them. That’s one of the reasons I started chicagosilver.com, to try and educate people about who the makers were, what the marks were, what the movement was, and give them some really good examples to admire. Collectors Weekly: What was the Kalo Shop? Somerson: Chicago and Boston were the two centers of the Arts and Crafts metal movement, with Chicago having the most makers. The leading maker in Chicago was the Kalo Shop, started by Clara Welles and a few other women in 1900. They mostly marketed by word of mouth, and had a very loyal clientele. When someone in Chicago or the Midwest was thinking about buying a nice handmade tea set or a tray, people would tell them to go to the Kalo Shop. 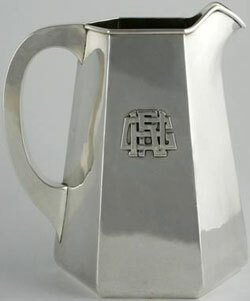 They produced a wide range of products for seventy years, a full line of Holloware, jewelry, and flatware. And because they made things by hand, they would take custom orders. The Kalo Shop was the best known and most successful of all the handwrought silver makers in the country and I have a particular affinity for their work. Collectors Weekly: How about some other manufacturers? Somerson: There were a number of Chicago shops that competed with Kalo, makers like Lebolt, Randahl, Mulholland, Novick, and Cellini. Many of those makers learned their trade by working at the Kalo Shop before starting their own businesses. They produced a lot of the same things but not at the same scale because Kalo was a bigger operation. A lot of the other Chicago manufacturers couldn’t keep up so they started making things by machine. Boston was different, there weren’t as many giant hand-wrought silver companies as in Chicago, there were more boutique makers, people like Mary Catherine Knight. Some of my favorite objects are handmade pieces from people like Oakes, Hale, Shaw, and James Winn. There’s also enamel work, which is very underreported, mostly by women like Margaret Rogers, Mary Winlock, Mary Catherine Knight, Mildred Watkins, Rebecca Cauman, and Gertrude Twichell. They made beautiful jewelry and objects like bowls with enamel. I love Holloware, too, from makers like Kalo and Lebolt. They’d start with a flat piece of silver, a torch, some hammers, and a saw, and three days later they’d have a pitcher with a handle. A lot of people stick up their noses and think that fine art is all that matters and pitchers and trays are boring, but I find the better decorative art examples absolutely stunning. Many have monograms on them, the best of which were applied, meaning the jeweler or crafts person cut letters out of silver and made little jewel-like objects and then soldered them onto the piece. There were also people who engraved monograms or hammered them from the back. One of the few great California Arts and Crafts makers, Clemens Friedell, was right up there with Kalo and he’s known for his beautiful hammered monograms. 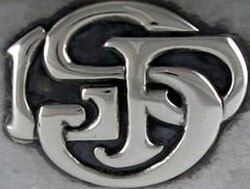 The monograms themselves are little works of art, they help define the piece. They usually were the initials of the purchaser or the recipient of the piece. 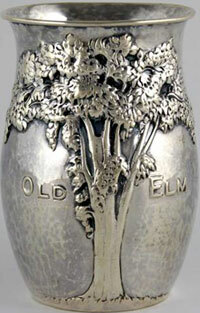 Silver was also used for awards and a lot of times pieces would have inscriptions, usually engraved. These Arts and Crafts makers were real artisans, they not only knew how to design something beautiful, they also knew how to make it and how to decorate it by adding details like enamel or chasing. Another Boston maker I should mention, Arthur Stone, was probably the only handwrought maker on the same level as Kalo. I had to choose between them early on because I just couldn’t handle both. I went with Kalo because they made a wider range of products, including jewelry. Stone was well known for chasing lines and decorative patterns that were incised into the side of a piece. A lot of people like the roughness of Arts and Crafts work. It’s massive and powerful. You can still see the hammer marks on the sides and though the pieces sometimes do have feminine lines, a lot of them were so heavy and imposing and almost architectural that they made a really powerful statement. When makers were happy with a design they’d make multiple copies. With Kalo, I can have half a dozen copies, but because everything was made by hand certain parts would be a little different. And over time the designs changed, too. There was definitely an earlier Art Nouveau type feel and later an Art Deco feel. 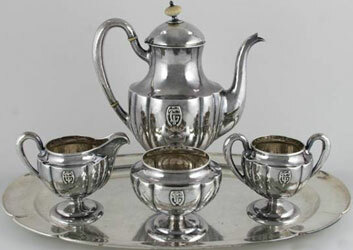 When Georg Jensen became popular, people started making silver in the “Danish” taste. Collectors Weekly: Do you still actively collect? Somerson: What I’m doing these days is learning as much as I can, trying to improve the website, and cataloging and photographing everything I have, measuring and describing it. I’m selling some items. I’m doing mostly academic and historical research, but from time to time I do see something I like, and the nice thing about having a lot of silver is that I can trade with people. I would love to have a museum or put my collection on display somewhere. Collectors Weekly: How has collecting Arts and Crafts pieces changed since you started? Somerson: It used to be that there were more dealers and more catalogues and the prices were cheaper. eBay has really changed the business, there are not a lot of good examples out there because people have bought them on eBay and taken them off the market to put into collections. And the jewelry sells, not only to people who collect Arts and Crafts items, but to people who just appreciate pretty jewelry. There’s only one Arts and Crafts maker who is still alive and that’s Laurence Foss. 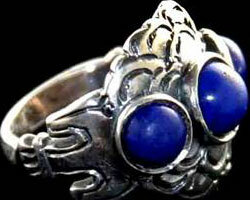 He was taught by Edward Oakes, one of the best Arts and Crafts jewelers, who trained with Frank Hale. And Hale trained with Ashbee, who was one of the fathers of the Arts and Crafts movement. Foss is now in his 80s and extremely under-appreciated. He made a lot of pieces for Georg Jensen and then went off on his own. He’s retired but until recently still made his own items. Collectors Weekly: Do you collect European silver also? Somerson: I almost exclusively collect American work but I happen to love English work, Austrian and German work, and some French work. There are two dealers in England, Vandenbosch and Tadema, who are the two best sources of European metalwork. Once you get an eye for this you can notice the cultural and style differences between the tastes of Europe and America. The Arts and Crafts movement in America happened a few years after the similar one in Europe, but in my opinion, the heyday of this movement was the very early 1900s. In Europe it had started 20 years before. Rosalie Berberian said there’s no such thing as an Arts and Crafts style because it overlapped so many other periods. But there’s an Arts and Crafts ethos and feeling, making things by hand, leaving visible hammer marks, using nature as a model, and relying on bezel-set semiprecious stones. You can look at certain pieces and see characteristics that clearly make them Arts and Crafts. One of the other interesting things about the Arts and Crafts movement is that a lot of the makers and designers were women. Clara Welles, the founder of the Kalo Shop, was a very well known suffragette and spent a lot of her time and money fighting for women’s rights. There are pictures of her taking Kalo silver pieces to be melted down so she could help fund the suffragette and women’s voting rights movement. Collectors Weekly: What can you tell us about silver marks and inscriptions? Somerson: In England there were strict laws that governed silver, so at a certain point every piece had to have marks for the silver content, the assay office for the city in which it was made, and the date plus the maker. In America it was often hit or miss. One of the things I like, which many people hate, is silver items with inscriptions, for example for birthdays or anniversaries. It’s a great way to date pieces. With Kalo there are maybe half a dozen marks you can generally use to put things in certain date ranges. But it’s sometimes hard to be precise — you can’t always tell if something was made in 1920 or 1959. Kalo was very fastidious about marking their pieces with the word “Kalo” however. I wish there had been stricter rules in the U.S. about marks. Jewelry is the worst, a lot of pieces are unmarked, so it may be obvious that an object was designed by a master, but you just don’t know who. Edward Oakes, one of the best Arts and Crafts jewelers, made something like 20,000 pieces over his lifetime and only a small number were marked. If you handle a lot of his work and are interested in it historically, you can make a pretty educated guess. I have a huge library of magazine articles and catalogues, which I’ve started to put on the website. A lot of times you find something that looks like a piece from a catalogue or an article and you can match it. But quite a bit of Arts and Crafts silver from America is unsigned. I’ve also seen fake marks over the years, that say Kalo but were clearly not done by Kalo. A piece with a Kalo mark on the bottom will sell for a lot more. But usually the forgers don’t pay attention to the details like the spacing they used, or the font. It’s not a huge problem yet, but it’s something you have to watch out for. More common are misattributions, when people say they’re experts and they guarantee that a piece was made by a certain maker, and it was clearly not. A little bit of knowledge can be a dangerous thing. Collectors Weekly: What advice do you have for collectors who are just starting out? Somerson: Read as much as you can about who made what and what to look for. There’s a bibliography on my site that lists resources and places to find information. Start small, buying inexpensive things where you can’t go too far wrong like flatware, bowls, and simple pieces of jewelry. If you’re really serious about it, go to all the venues, look at the auction houses, go to the shows in Chicago, New York, and San Francisco if you can. Find the few dealers who are out there and call them and tell them what you’re looking for. eBay is a source, but it’s a flea market, so you have to be able to find the things first, know how much they’re worth, and not get too caught up in the bidding craziness. There’s a series of books by Dorling Kindersley that show really nice examples and values. But the values change. I recommend that people just become watchers on eBay to see what’s up there and what people are paying for things. One category that’s a sleeper that I think will become more popular is aluminum. Back when the Arts and Crafts movement was popular, aluminum wasn’t a cheap metal like it is today. Some makers made things by hand out of aluminum, and pewter and they’re beautiful. Another way to start is to collect flatware, which is highly under-appreciated. A good rule of thumb for Kalo is that it’s generally 100 dollars an inch for lesser Holloware, and 1000 dollars an inch for great pieces like candlesticks. With smaller flatware you can buy really beautiful pieces all made by hand for fifty to seventy-five dollars. Collectors Weekly: Anything else that you would like to mention? Somerson: For a while I was just a collector, not selling anything. The idea of parting with one of these pieces was hard, they were like my children, each special in its own way. Then people started calling me saying they were searching on Google for their grandpa’s name and my site came up and there was a pitcher with his name on it. He won an award back then and it’s on your site, will you sell it to us. That’s happened half a dozen or so times and I always say said sure, why not. To me its it was the right thing to do, it really belongs in the family. Sometimes I’d get a letter back from the family saying they had a big family meeting to unveil the piece, and were very emotional about it. A lot of silver was used to commemorate people and events, so there’s not only beauty associated with it, there’s history. Now however, I do sell a fair amount of items online. A lot of people don’t like monograms because it’s not their initials, and they get them removed, which I think is criminal, especially if they were engraved. Its almost as bad as melting the silver. It destroys the artistic and historical integrity. Also, if you see an ad telling you to bring down your unwanted Arts and Crafts silver and they’ll give you cash for it, don’t do it. Take it to a legitimate antique dealer, or look up the mark and try to figure it out online. You can probably get more money by selling it to a collector or dealer than by melting it down. One final note, there is a ton of machine-made silver from that period, and the beautiful thing about Arts and Crafts silver is that it was handmade by artisans, with superior design and workmanship. But a lot of big companies just shot tons of silver out of machines. The designs weren’t very original, and the manufacturing wasn’t that great. That’s one of the reasons why silver isn’t worth as much as it should be because people go to antique stores and see these big boxes of machine made silver bowls all stuck together and they’re not very pretty, and people confuse it with beautiful handmade Arts and Crafts silver. If that machine-made stuff gets melted down it’s not really a crime, it’s ugly and it doesn’t really have a soul compared to something that took one person a whole week to make and a lot of integrity and heart. They are apples and oranges. I enjoyed your aricle. I have 10 hammers from the Kalo Shop silversmiths. I too enjoyed Mr. Somerson’s interview. I am a silversmith working in the arts and craft tradition and would be very interested in hammers from the Kalo Shop. Just by a lucky accident did I come across this article. Fantastic! So glad there are collectors and scholars out there like you for this very under rated medium. We will surely meet one day. I am the last apprentice from the Porter Blanchard shop – Porter personally taught me the trade as did his son-in-law Lewis Wise. For the past 40 years I have been an active silversmith and have work in the Renwick, Oakland Museum of Arts and Crafts, White House Collection of American Craft among others. My greatest source of pride are all of Porter’s tools and George Porter Blanchard’s tools from Gardner Ma. I HAVE SEEN KALO AND WOULD LOVE TO OWN A PIECE. I HAVE A WALTER JENNING’S WALTER JENNINGS, HANDCRAFTED SILVER BRACELET. JENNINGS WAS AN ARTISANAND WORKED FOR ROYCROFT AND THEN WENT OUT ON HIS OWN. I KNOW HIS JEWELRY IS SOUGHT AFTER. WHERE COULD I SELL THIS? Thank you for an informative and interesting article. I shall check out your Chicago Silver website. I have 12 place settings of a Marshall Field workshop set of “Colonial” flatware, a very simple hand-hammered pattern with an appliqued block-lettered “M” monogram. The place-setting includes all the standard pieces except a soup/dessert spoon and I have been searching, haunting antique shows and visiting web-sites for years to find 12 compatible spoons. Obviously, I could have a silversmith, at a fairly steep price incidentally, make 12 spoons. And makers such as Old Newbury Crafters now produce similarly patterned hand-hammered spoons, but I would much prefer to find a set of 12 old Marshall Field pieces. If anyone has such a set or knows of such pieces for sale I would appreciate a response. I came across this article about you and realize that we have totally missed out on the blessing of getting to know you other than across the stone wall. Sam is getting bigger every time we see him and I told Chi we must be the worst neighbors in the entire world. We both are interested in The American Arts & Crafts movement. My father worked summers for Elbert E. Hubbard at The Roycroft Shoppes in upstate New York. Let’s make a time to get together and get to know one another! Caryl, have you had any luck getting information about he perfume tray? I am also trying to get information on it as I also have one. I’m not having much luck. I have a silver bracelet that I believe is a Kerr piece with two silver pictures of a lady with flowing hair. There are cherry blossoms in between these two ladies with a double latch catch. The back appears to be beaten silver. Can you tell me how I could authenticate it? I did see a picture of one of the ladies in a museum book on I believe Art Nouveau. Any help you can give would be greatly appreciated. This is beautiful craftsmanship! I love seeing the variety a skilled craftsman can display in silver. The article mentions the issue of cleaning silver. As a collector, I do not find this to be the big deal many people seem to make of it. I spend very little time cleaning my silver, and on those rare occasions when I do clean it, I do so very lightly and gently, often just with soap and water. 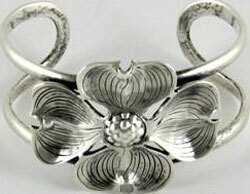 A certain amount of tarnish is essential to any piece of decorated silver. Without tarnish, the decoration would not be thrown into relief and would be almost invisible. Cleaning a piece heavily can ruin it. Silver that is properly stored basically doesn’t tarnish at all. I have 3 Kalo Hand Wrought Bangle bracelets in their pouches that were my mothers. Kalo also did some custom work for Herman H. Hettler Lumber Company in Chicago where my grandfather and father worked. I have one of the sterling silver lumberman cufflinks that were my fathers and I had it converted so I could were it as a necklace. It is beautifully made. I wish I had my mom’s other Kalo pieces.